Okay, now here’s something that is probably going to come as a big surprise to you: The Evolutionary tab in Excel provides buttons and boxes for managing the way Solver works when you’re using the Evolutionary solving method. For example, you can use the Convergence box to specify how closely Solver needs to get to the optimal function value in order for you to call the job done. In precise terms, the value you enter into the Convergence text box specifies the maximum percentage difference in the objective function values that Solver should allow in order to justify stopping its search for an optima. 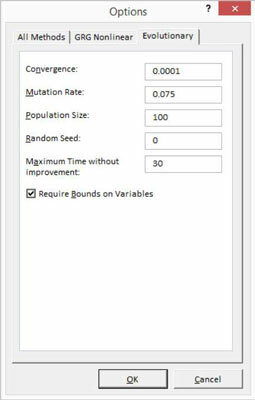 The Mutation Rate box, which accepts values between 0 and 1, lets you control how much variables are altered (or “mutated”) in a search for an optimal solution. And the Population Size box lets you specify how many different data points the Solver maintains at a time in its search for an optimal solution. The Random Seed box lets you supply a starting integer for the random number generator used by the Evolutionary method. The Maximum Time (In Seconds) box lets you do just what you’d guess: Tell Excel to stop wasting time at some point if it’s not making progress. Finally, as with the GRG Nonlinear solving method, you can check and uncheck the Require Bounds On Variables box to specify that the evolutionary solving only occurs when you set both upper and lower limits for the variables.